Many of you have read my posts on my all time favorite food trucks, the New Haven waterfront Mexican Taco trucks....nothing beats these in my opinion, well..........almost nothing. Slowly a new age of food trucks are invading the nation, from grilled cheese trucks, crepes, Korean BBQ ...you name it I can almost guarantee theres a food truck out there serving it. 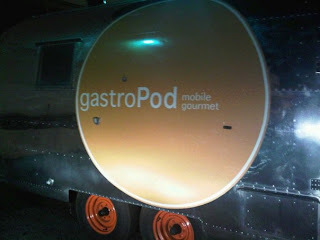 A friend and chef "Jeremiah the Bullfrog" out of the 305 rolls with the Gastro Pod, Miamis gourmet food truck experience. I was fortunate to get to catch up and see him in NYC at this years Starchefs Congress and I was surprised to peek in the window and see the immersion circulator going, CVAP technology and his "spice" rack of chemicals. The food was amazing, nothing he served was missing the mark....my favorite was the Chinito Cuban made with Bentons ham & pork belly terrine, not the typical food truck experience. Thanks Bullfrog, great job! There's even been movement on the Boston food truck front . First, several new vendors are occupying the Greenway. Citysearch held Boston's first Food Truck Festival, in the South End. If you know food here in Boston then you Craige on Main, former manager Joshua Cole and his friend Reuben bring Boston "Tacos Locales", their take on gourmet Mexican on wheels, with menu items like the squash blossom quesadilla and grilled corn with queso fresco....executed perfectly ....no need to travel to New Haven every weekend. In Providence R.I. theres "SugarRush"....a gourmet cupcake and dessert truck and yes only using sustainable and organic products. Point of the post today.....food trucks are coming, support your local food truck!